Familiarize yourself with these saws and their uses, and your next DIY project is sure to be a cut above the rest. Whether you want to build a rustic bench, install trim molding, or plumb a new sink, odds are that you’ll need to cut some material to size—and there’s a saw out there waiting to help you do just that. The following seven types of saws cover a spectrum of DIY scenarios, from wood to metal. Familiarize yourself with which specialties each possess, and you can tackle whatever project you have in mind. As you go about adding saws to your toolbox and workshop, you’ll find that many saw blades are rated by teeth per inch (TPI). These numbers range from 2 to 32. Blades with lower TPI numbers will cut quickly but produce rougher cuts. The higher TPI ratings will produce fine, smooth cuts in wood and similar materials. No woodworker’s shop is complete without a traditional handsaw, with its large blade and sturdy handle. Though the handsaw is 100 percent muscle-powered, it steps in when a power saw just won’t do, such as when you need to cut through a post that is too thick for a circular saw blade. Choose the type of traditional handsaw you need based on the cut you intend to make and the TPI needed to make it. • If you need to rip wood (or cut wood lengthwise with its grain), choose a rip saw with large, angled teeth and an average of 5 TPI. • Cutting across the grain of the wood takes a crosscut handsaw, which has between 10 and 12 TPI and shorter teeth than a rip saw. • Looking for a do-it-all compromise? The dual-cut (or “hybrid”) handsaw features an average of 6 to 8 TPI and can both rip wood and cut across the grain. Best For: Cutting wood by hand. 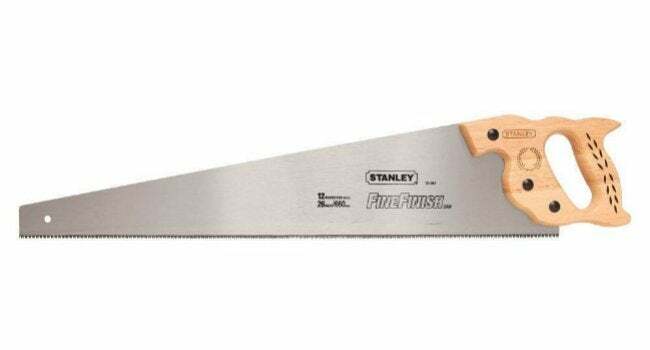 For an all-around, affordable crosscut handsaw, you won’t go wrong with Stanley’s 26-Inch Short Cut Saw ($19.99 on Amazon). With 12 TPI, it produces quick and smooth cross-grain cuts. When you’re ready to invest in a saw with ripping power that will last for years, though, consider Crown’s 190, 24-inch Rip Saw and its 4.1 TPI ($82.85 on Amazon). • Small teeth on the raker set hacksaw blade are arranged in sets of three for easy cutting of standard metal pipes. • A regular set hacksaw blade features teeth positioned next to one another without spaces, but every other tooth angles a different direction, either forward or backward. It’s intended for cutting soft metal and other materials, such as PVC. • On a wavy set blade, the teeth are positioned next to one another, but the tooth pattern features a slight wave from one side to the other. Choose this type of blade when cutting thin metal, such as ducting. Best For: Cutting metal. 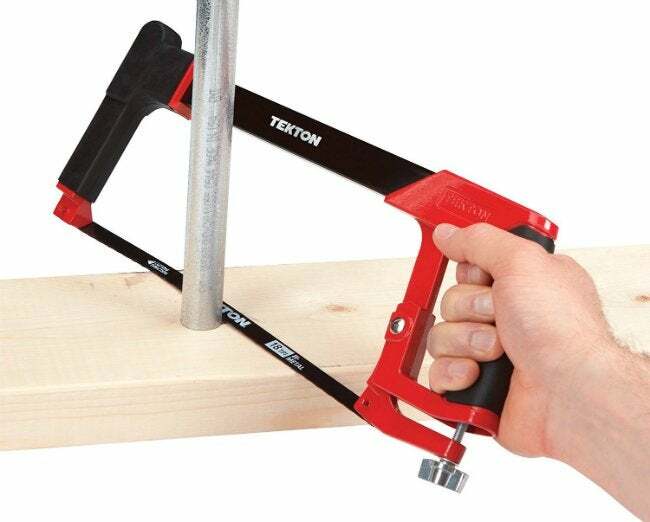 For good cutting control, we like the rubber grips on both the handle and the front frame of TEKTON’s 2-in-1 High Tension Hacksaw, which allows the user to hold the saw with both hands ($12.99 at Amazon). The TEKTON saw comes with one 12-inch, 18 TPI blade and can store six more blades in its handle. The U-shaped coping saw has only one purpose: coping or “back-beveled” cuts for trim installation around inside corners. While it resembles and functions like a hacksaw, the coping saw’s frame is lighter in weight and the blade is shorter—typically 6-¾”-long and anywhere from 10 to 32 TPI. The tiny blades make it possible to back-cut curves and create precise joints when installing crown molding and other types of trim. Best For: Creating professional-looking inside corner joints when installing trim. 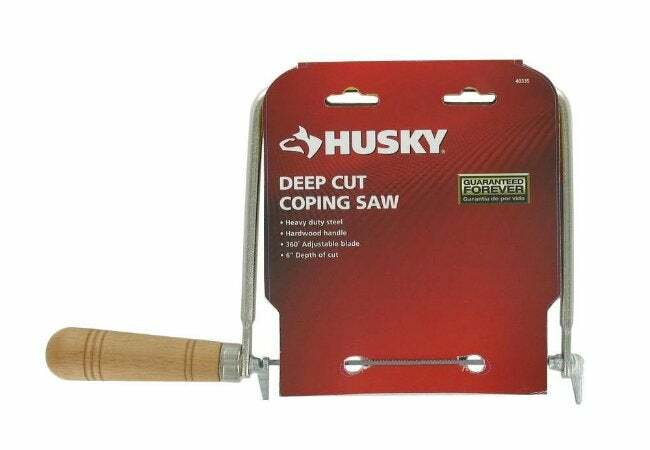 For sharp, accurate coping cuts, we like the Husky 6.5” Deep-Cut Coping Saw ($7.88 at Home Depot). It features a deep frame throat, giving you plenty of room to back-cut even wide pieces of trim, and its 32 TPI blade can be rotated a full 360-degrees to saw at virtually any angle. A versatile saw for DIYers, the jigsaw can cut straight lines like a circular saw (see below) but its real claim to fame is the ability to cut curves. Considered one of the safer power saws, the jigsaw features a large flat base called a “shoe,” which rests flat on the surface of the material you’re cutting and surrounds the blade and offers some protection. Many jigsaws come with an adjustable shoe that tilts, allowing you to cut on an angle when needed. These types of saws can cut nearly any type of wood using blades with a TPI between 8 and 10. The teeth on a standard jigsaw blade point upward, so the saw cuts on the blade’s upstroke. Reverse blades, which cut on the downstroke, are available for cutting materials with a finished surface, such as a laminate countertop. While blades come in a variety of lengths, width depends on the curve: Choose one that is 1/4”-wide to cut tight curves and 3/8”-wide blades to cut standard curves. Best For: Cutting curves in wood. If you’re looking for a dependable jigsaw for DIY projects, large or small, consider DEWALT’s corded 5.5 Amp Top Handle Jigsaw kit ($99 on Amazon). It has a variable speed dial for adjusting cutting speed, and it comes with its own carrying bag. 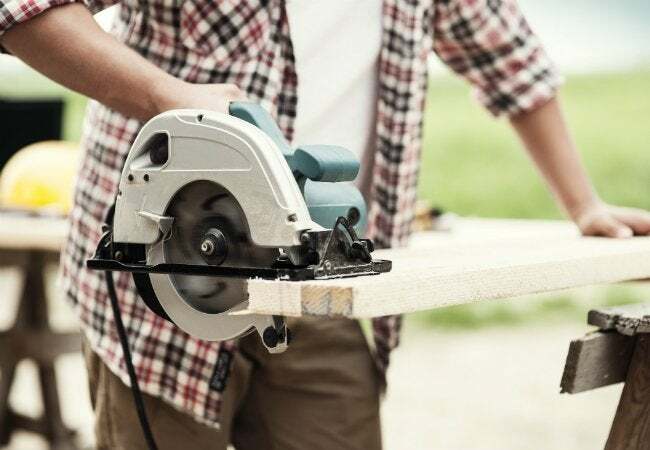 Designed to cut straight lines in dimensional lumber, plywood, rigid foam board, and even concrete, the circular saw is one of the most popular saws for framing and can substitute on the jobsite for a table saw. It features an encased circular blade and a wide base that fits flat against the material you’re cutting and, on most models, adjusted so you can vary the depth of the cut. Circular saw blades are labeled for the type of material they’re designed to cut: Wood blades cut plywood or lumber, masonry blades cut joints in a concrete sidewalk, and so on. Circular saws come in a variety of sizes, determined by the diameter of the blade they use. While the most common blade diameter for circular saws is 7-1/4 inches (suitable for most construction tasks), you can find saws with blades as small as 4 inches for light woodworking projects or a large as 12 inches for cutting heavy timbers. Best For: Cutting framing materials, including wall studs, joists, rafters, and sheathing. 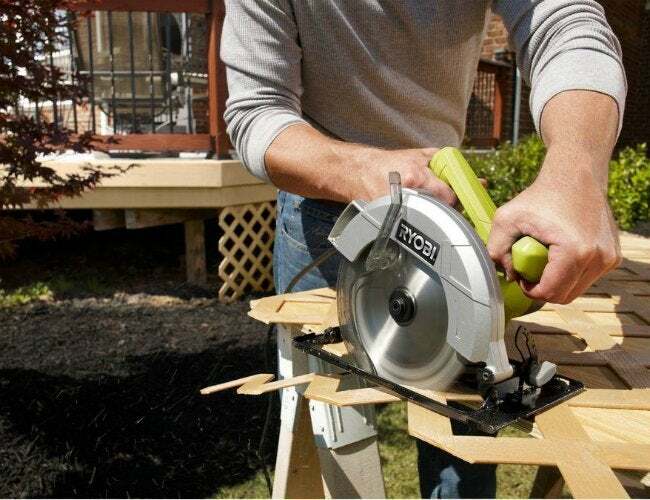 If you enjoy building garden sheds, playhouses, and other structures, the RYOBI 7-1/4-inch 13-Amp Circular Saw is an affordable, yet dependable, circular saw ($39.97 at Home Depot). 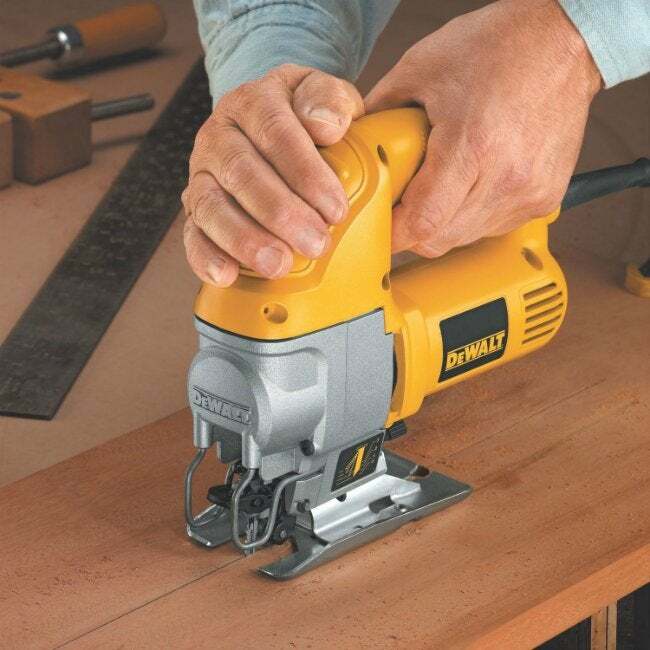 It comes with a spindle lock for easy blade changes, and its 13 Amp motor is suitable for cutting through plywood and standard dimensional lumber. The main purpose of a miter saw is to make precision crosscuts when framing, installing molding, or even cutting siding strips. Today’s miter saws make angled cuts based on the same principle as their manual “miter box” siblings, although they can perform even more complex cuts. A miter saw’s heavy steel base can be mounted on a workshop table for stability, and a steel guide along its back edge, called a “fence,” aligns the material to be cut. The actual saw blade is housed in a large disk on an adjustable arm that can be raised and lowered as well as swiveled from side to side to cut on virtually any angle. While all miter saws make angled cuts, a compound miter saw has the ability to tilt on its axis to make slanted cuts in addition to angled cuts. On a sliding miter saw, the arm can be pulled forward when the saw is operating, making it possible to cut wider boards or strips of siding. Some high-end miter saws feature laser guides for extra-precise cuts. Miter saws are available in 10-inch and 12-inch sizes and range in price from around $100 to over $600, depending on quality. The larger 12-inch size is usually reserved for commercial use. Best For: Framing and finish carpentry when you need to make simple or complex angle cuts. 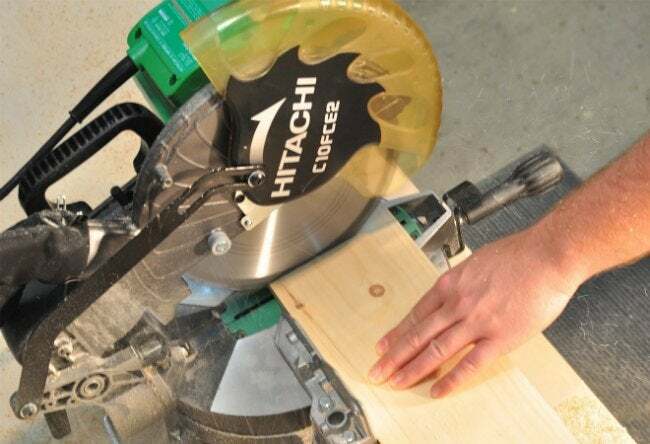 The Hitachi 15-Amp, 10-inch Compound Miter Saw features a 24 TPI blade for angled cuts and simple bevel cuts—making it a solid choice for most DIY building and trimming projects ($109 on Amazon). The chainsaw is designed to cut tree limbs or fell entire trees with its dozens of sharp teeth that rotate around the guide bar. Guide bars range from 14 inches long (for light cutting and pruning) up to 36 inches long (for use by lumberjacks) and can be interchangeable on some models of chainsaws. For most DIYers, a chainsaw with an 18- to 20-inch guide bar is sufficient. Keep in mind that a 16-inch chainsaw bar will fell a tree that’s 32-inch in diameter by sawing systematically around the entire trunk of the tree. While some smaller, corded chainsaws work for trimming and pruning nearby the house, most are fuel-operated and can be taken into remote areas for harvesting firewood. Prices start under $100 for lightweight electric models and run into the thousands for commercial-grade chainsaws. Safety Note: Chainsaws are among the most powerful saws around, but they’re also dangerous because the tip of the guide bar can kick back during operation. Before operating any chainsaw, read the owner’s manual carefully and familiarize yourself with the saw’s safety features and safe operating techniques. Best For: Cutting firewood and trimming trees. 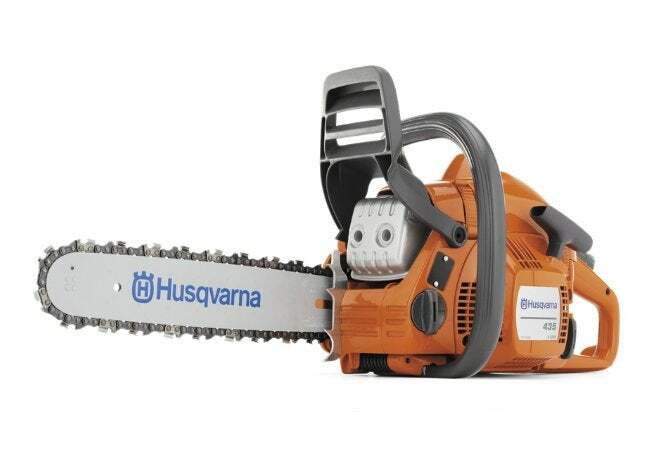 The Husqvarna 44E 16-inch 2-Stroke, X-Torq Gas-powered Chain Saw makes quick work of pruning branches and harvesting firewood ($299.95 on Amazon). It comes with a 16-inch guide bar, and it can be fitted with a longer 18-inch bar if desired. Though not the cheapest model on the market, this 10 lb. chainsaw is powerful and relatively lightweight, so you can cut without suffering too much arm and back strain.